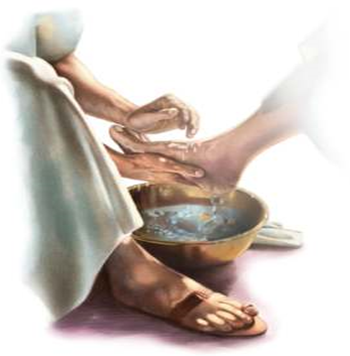 What does it mean to be a “Servant of the Lord?” The highest title or tribute you could give a person in the Old Testament was to call him - "the servant of Yahweh" ('ebed YHVH). The Hebrew word for servant, “eber” denotes that …”God given authority to the accredited messengers of the Lord." The servant of the LORD was one who was chosen by God and the origin implies the position of a slave but is not as the world views a “slave” …but rather as one unconditionally and willingly serves God wholeheartedly. A ‘servant’ may not seem important, but the original language has different words for different types of servants. Here, the word describes someone who has freely chosen to serve the master. Perhaps this servant does this work because of his love for the master. Such servants received great honour. Their masters considered them to be almost part of the family. 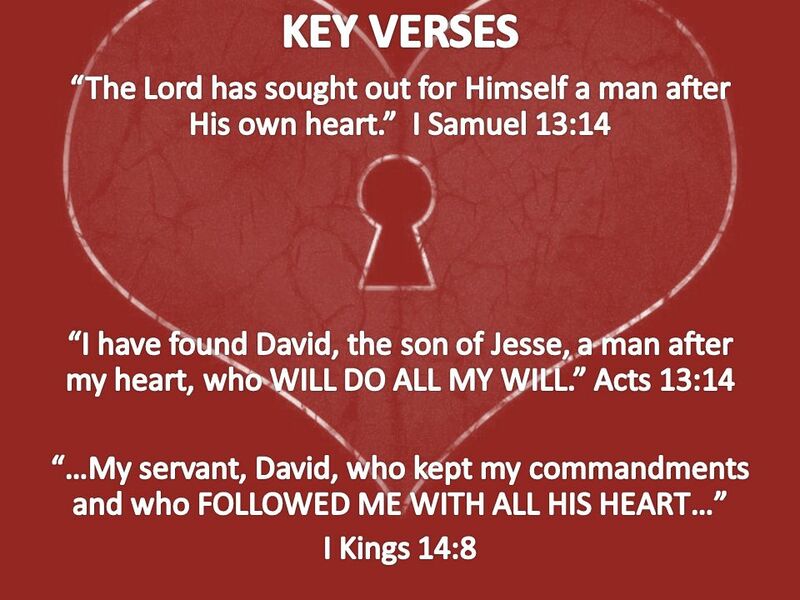 Then what are the different characteristics of an obedient servant of God? Throughout the Bible, there were some distinct characteristics of all the servants of the Lord …and they are our examples of how we should serve the Lord. Well let’s look at what the Bible – Old Testament says about Abraham… The Biblical account of Abraham starts with God making the following promises to him; “I will make you into a great nation, and I will bless you; I will make your name great, and you will be a blessing. I will bless those who bless you, and whoever curses you I will curse; and all peoples on earth will be blessed through you,” Genesis 12:2-3. Abram (Abraham’s) obedience (Genesis 12:4) has shaken our world for thousands of years – just as Abraham obeyed God way back then, today Israel’s existence is living testimony to this. God has promises to bless or curse depending upon how we treat His people (Jews) and Israel and nothing has changed! God’s land, Israel and especially Jerusalem is important to the prophetic purposes of God and so it should be for us too! We choose blessing! Abraham had many encounters with God throughout his journey to the Promised Land – Israel, and one of those are when God told him to sacrifice his son Isaac. Many people can't believe in a God who would ask such a thing …and even we as parents have a hard time envisioning being able to obey God in such a scenario …but, then we are failing to look at the bigger picture! 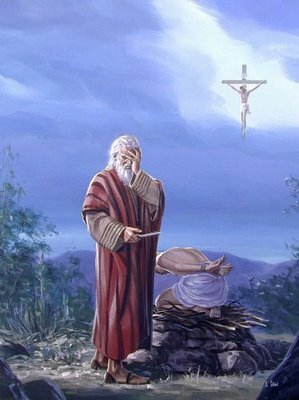 Surely, it must have been very confusing to Abraham, to have God ask him to take his child - who God had promised would be the child of promise and father many nations, and sacrifice him. However, we read in Hebrews11:17-19, that Abraham believed that God would raise Isaac from the dead. He did not believe God would go back on His promise about Isaac. Abraham reasoned that God could raise the dead …and figuratively speaking, he did receive Isaac back from death. God asked him to sacrifice his one and only son. This wasn't just a simple test - this was a foreshadowing of what God Himself was going to do at the cross and this is the big picture. It's what everything in the Bible hinges on and God wasn't merely asking a man to do something horrible, it was a revelation about God, Himself …and.that God would not ask us to do such things, but would instead provide “a sacrifice” for us. It’s such a revelation when we look at John 3:16, “For God so loved the world that He gave His only Son (Yeshua – Jesus) …” don't think that Abraham was called God's friend merely because he obeyed God to the utmost limit, but also because in that moment he shared with a piece of God's own heart. Through that willingness to sacrifice his greatest treasure - Isaac, Abraham shared a glimpse into what God was willing to do for our sakes. The Lord Will Provide… Yeshua (Jesus) said, “Your father Abraham rejoiced to see My day and he saw it, and was glad,” John 8:56. Wow! Read it again! Abraham rejoiced at the thought of seeing Yeshua’ day (and our salvation) and when he saw it and was glad! Here we find it interesting that Yeshua (Jesus) used the past tense, as if Abraham had seen Yeshua' day back in the past. It does not say this in Genesis when Abraham offered Isaac as a sacrifice …but somehow Abraham saw Yeshua’s (Jesus) the Lamb of God, sacrifice on that day when He was going to offer Isaac as a sacrifice. In that moment, He realized from the pain of the sacrifice that He was about to make …the sacrifice that God Himself was going to make on our behalf. In Genesis 22:13; “When Abraham looked up, his eye fell upon a ram caught in the thicket by its horns. 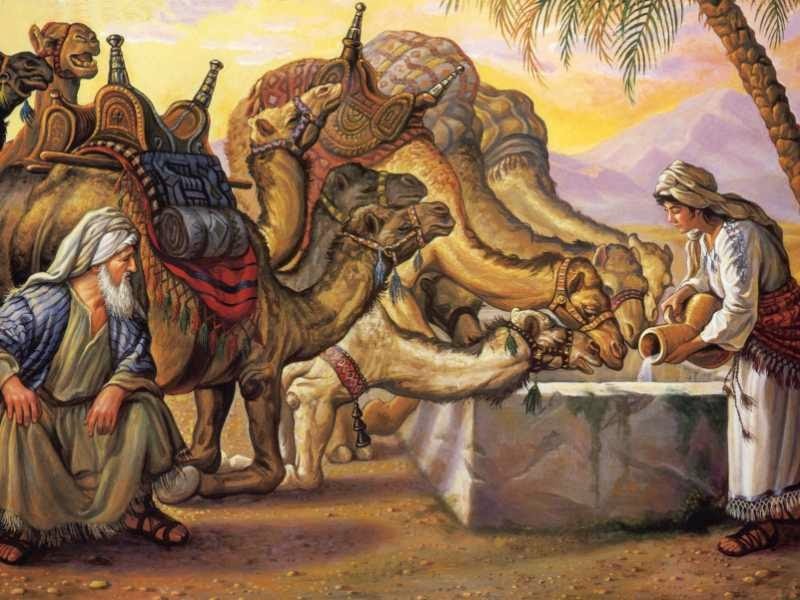 So Abraham went and took the ram and offered it as a burnt offering in place of his son.” God provided a “Ram” (Hebrew “Ayil” meaning “exulted” or “strength” - and represents royalty!) And on that day, Abraham called that place; "The Lord Will Provide!" The story of Eliezer when Abraham sent him to seek a wife for his son Isaac is a great example of an obedient, willing servant… Eliezer was dependable and trustworthy (Genesis 24:2). 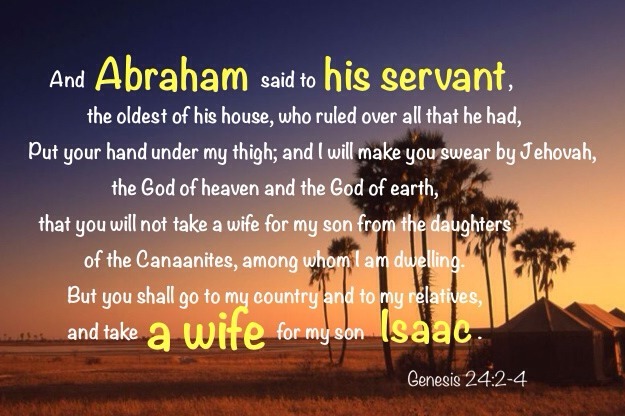 Abraham must have called Eliezer who was the eldest servant of his household to go and seek a wife for his son, Isaac, because he could have trusted him. Eliezer was willing to serve his master in whatever capacity Abraham chose. Not only that, but he was also in charge of everything Abraham had. Can God trust you with riches, to serve his people in whatever capacity? Can He trust you to with power and influence? The Bible states; that he that is faithful in little, will be faithful in much! Eliezer was a praying person… “And he said, O LORD God of my master Abraham, I pray you, send me good speed this day, and show kindness to my master Abraham,´ Genesis 24:12. Abraham servant knew the power of prayer, no doubt being in Abraham’s company for many years had taught him that God is faithful and answers prayers. God wants to hear from his people, in fact, man was created to have a close relationship with God. The Bible lets us know that God came down in the Garden of Eden each day to talk to Adam. God wants to do the same with us. Eliezer was so earnest that he refused to eat before attending his masters business (Genesis 24:33) and allowed nothing to stand in his way of accomplishing the job that was given to him. "And there was set meat before him to eat: but he said, I will not eat, until I have told mine errand. And he said, Speak on. And he said, I am Abraham's servant. And the Lord blessed my master exceedingly, and he became great, and He gave him sheep and cattle, silver and gold, man servants and maid servants, camels and donkeys. And, Sarah, my master's wife, bore a son to my master after she had become old, and he gave him all that he possesses. And, my master made me swear, saying, you shall not take a wife to my son of the daughters of the Canaanites, in whose land I dwell: but you shall go unto my father's house, and to my kindred, and take a wife for my son," Genesis 24:33-38. Just like Abraham everything that we have and can do is because of God and it is Him that has given us the power and anointing to do all we do. We are never to take the credit or glory, but always pass it on to God and never to think for one moment that it is merely our doing, but it is God’s! We know nothing unless God allows it or gives it to us therefore must give God all the glory and try to use it for his service. Eliezer gives God glory (Genesis 24:48) and acknowledge that it was God who had made his journey successful - he did not do it by himself! Eliezer realised this and always gave credit to God and Abraham his master! Eliezer made prayer his first priority! Arriving at his destination, Eliezer started with prayer. He immediately talked to God about why he was praying. He prayed for success because he wanted to honor the task given him by his master, Abraham. He didn’t tell God what to do and he approached Him first with the reason for his request. Eliezer spoke openly with God… He talked to him about a specific way that he would know that God had answered his prayer. He did not want to seek just any girl of his own choosing - he wanted it to be God’s choice for Isaac. He asked God for a specific answer so that he could know with assurance he was following His will. Eliezer responded to God... When he saw a potential answer to his prayer, he ran to meet Rebekah who was beautiful, as the Bible tells us.. She looked like the kind of girl Eliezer would like to take home to meet Isaac – but, was she the one? He ran in faith, he did not hesitate, to find out by praying and asking God to show him (Genesis 24:18-23). Eliezer showed patience... He remained silent, watching the young woman, no doubt observing how she responded to the animals. Eliezer sought an answer. Eliezer is an example of prayer when after he has waited in patience, he asked for a decision. He was not afraid and he did not fear rejection. If this girl was part of God’s plan for his people - a HUGE plan - he had to find out. Then the answer from Rebecca ans so she said to him, "I am the daughter of Bethuel, Milcah's son, whom she bore to Nahor." Moreover she said to him, "We have both straw and feed enough, and room to lodge." Then Eliezer bowed down and worshiped the LORD. And he said, "Blessed be the LORD God of my master Abraham, who has not forsaken His mercy and His truth toward my master. As for me, being on the way, the LORD led me to the house of my master's brethren," Genesis 24:24-27. In summary; Eliezer in his selfless love for Abraham - “his master” - went out with one mission to fulfil his promise to win the girl for his master’s son, Isaac. He was not so much concern about receiving praise, honour or glory but he was determined to do the will of his master. Eliezer could have stolen or cheated his master goods, and even mistreat his masters servants as he was placed in charge of not only his master goods but also his servants …but Eliezer didn’t and was faithful until the end. True servants of The Lord will always try to acknowledge and praise the Lord and give honour to Him in whatever they do. 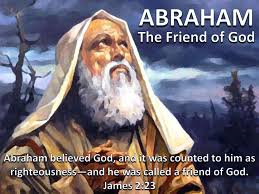 Abraham was called God’s friend… (2 Chronicles 20:7; Isaiah 41:8; James 2:23). Moses was also referred to as His friend; “the Lord would speak to Moses face to face, as a man speaks with his friend,” Exodus 33:11. Near the end of the book of Deuteronomy, it is written that, “no prophet has risen in Israel like Moses, whom the Lord knew face to face,” Deuteronomy 34:10. Wow! In the Bible, Abraham, however is a person in the Old Testament who is called; the friend of God” (2 Chronicles 20:7, Isaiah 41:8). Abraham was the servant of the Lord (Psalm 105:42). Even Moses to whom God spoke “face to face” was still called …”My servant Moses” (Numbers 12:7-8). So, if we can't help but wonder what it is that makes Abraham more than just a great servant of God like Moses and the prophets - the other great men in the Old Testament? Well, certainly we can't speak for God, but personally believe that it's because Abraham shared a common burden with God! Moses was a loyal ‘servant’ of God and is called “the servant of the LORD” and “Moses My servant” more often than anyone else in the Old Testament; Exodus 14:31; Numbers 12:7; Deuteronomy 34:5; Joshua 1:1, 15; 8:21, 23; 18:7; 1 Chronicles 6:49; 2 Chronicles 1:3; 24:6; Nehemiah 1:7; 10:29. “Moses the servant of Yahweh” is almost the official title of Moses (Deuteronomy 34:5; Numbers 12:7-8). The author of Hebrews describes Moses as a servant in God's house when he writes, “Moses was faithful in all His house as a servant, “Hebrews 13:5. Moses’ - Master was God! The words in Hebrews 3:5 come from Numbers 12:5-7 and they are words that God Himself spoke to Moses’ brother and sister, Aaron and Miriam. As we read further in Numbers 12:8-16, we read that Aaron and Miriam became jealous of Moses and began to speak against him. They too had spoken messages from God (Numbers 12:1-4) but they were not respecting Moses’ importance as God’s principal servant! Moses was a very humble man. He did not try to defend himself. But the things that they were saying offended God. God became angry with them. And so, God Himself, as Moses’ master, spoke to defend His servant Moses. God explained that His relationship with Moses was not like His relationship with other prophets. God may speak to his prophets in dreams and may show them something by means of visions …but God didn’t speak to Moses like that. God spoke directly to Moses and in a clear manner. God even allowed Moses to see him “face to face” (Exodus 33:18 to Exodus 34:7). God had made Moses responsible for His entire house – that is, for all the Israelites (God’s people). He gave them His law by means of Moses and He led them through the desert by means of Moses. God taught them how they should live by means of Moses, “His servant,” and He showed them how to worship (to give honour to God) by means of Moses. Moses did these things as evidence of the things that God would do in the future! 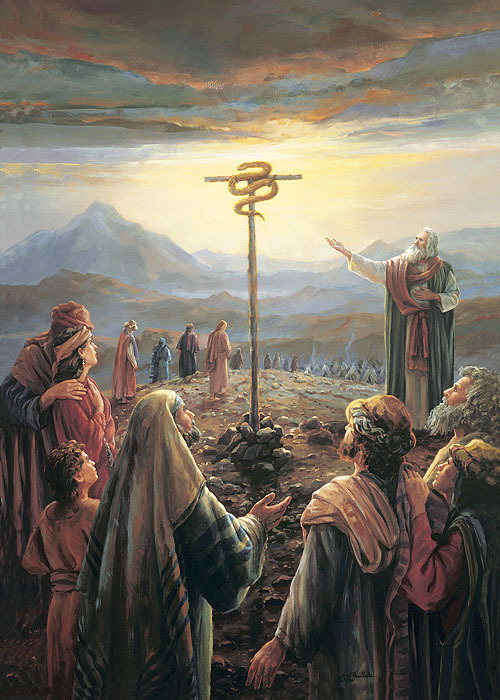 Moses did them so that the people could learn about the coming Messiah, Yeshua – Jesus Christ! God gave Moses His own personal name - “God said to Moses, “I AM WHO I AM.” This is what you are to say to the Israelites: “I AM has sent me to you.” And God said moreover unto Moses, Thus shall you say unto the children of Israel, The LORD God of your fathers, the God of Abraham, the God of Isaac, and the God of Jacob, has sent me unto you: this is My name for ever, and this is My memorial unto all generations, Exodus 3:14-15. There are several reasons why God did this. The Egyptians had many gods by many different names. Moses wanted to know God’s name so the Hebrew people would know exactly who had sent him to them. God called Himself I AM, a name which describes His eternal power and unchangeable character. “I AM THAT I AM,” declares God to be self-existent, without beginning, without end. This is also expressed in the term “Yahweh,” meaning “I Am the One Who Is.” It is the most significant name for God in the Old Testament. By identifying Himself as “I AM,” God is declaring that He always exists in the immediate now. He isn’t bound by time like we are. There was never a time when God wasn’t and He has no fixed point when He was born …or brought into being and He has NO beginning or end. He is the Aleph ve Tav, Alpha and the Omega, the First and the Last (Revelation 22:13). Think about this, Moses was called as servant of God, Yahweh - I AM THAT I AM! What a great honour! In Exodus 12:3-11, God told each Israelite family to choose an unblemished lamb on the 10th day of the month Abib. On the 14th day at twilight (just after sundown as the 14th began), they killed the lamb, putting its blood on the doorpost and lintel of their homes. Then they roasted and ate the lamb. The most spiritually significant of the ritual uses of hyssop in the Old Testament is recorded in Exodus 12:22. Moses has just given the instructions for the killing of the Passover lamb, and he continues with some further instructions that must have been rather startling for those participating Israelites; “And you shall take a bunch of hyssop, dip it in the blood (of the Passover lamb) that is in the basin, and strike the lintel and the two doorposts with the blood that is in the basin. And none of you shall go out of the door of his house until morning.” In this solemn Passover event of Exodus 12, God used blood of a different nature to represent the saving, life-giving power that only He, the almighty, Eternal God, possessed. The sacrificial lamb of Passover symbolized the Son of God, who would take upon Himself the role of the sacrificial Lamb of God (John 1:29). 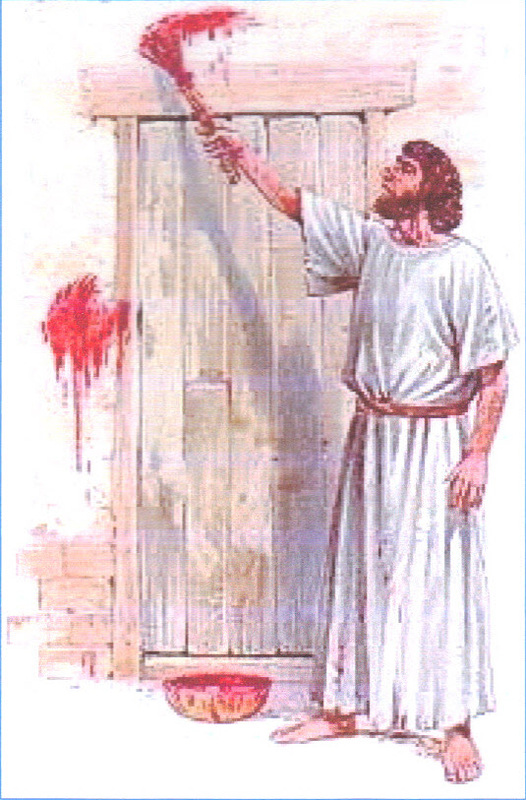 The shed blood of the Passover lamb symbolized the blood to be shed by the coming Messiah, Yeshua - Jesus. The bunch of hyssop was dipped into the blood, and per God's instructions to Moses, that blood was sprinkled or brushed on the doorposts and lintel of each home …and the Israelites were then told to stay within those homes, separated from the Egyptian people and their normal routines. That night, there was to be no interaction …or communication with any aspect of the Egyptian civilization. Their very lives depended on their following this command to the letter. The sacrificial blood, sprinkled or smeared by the bunch of hyssop, graphically represented a separation and a protection of Israel against the deadly havoc that God wrought upon Egypt that night. The blood ceremonially cleansed and protected the people inside those homes against the plague of death that struck Egypt, a people who practiced the filthy abominations of godlessness. For example - Moses taught the people about the Passover (the sacred holiday when people killed a young sheep) – Exodus 12:1-11 …but the real meaning is Christ – John 1:29. Moses taught the people how to build God’s house – Deuteronomy 12:5-14 …but the real meaning is Christ – John 2:19-21. God cured the people when Moses lifted a metal model of a snake among them – Numbers 21:6-9 …but the real meaning is Christ – John 3:14. For the Jew there is probably no one greater than Moses, the “great deliverer,” who, through a series of great miracles, led the Israelites out of Egypt. Yet as famous as Moses was, and is, nothing can compare to the one of whom Moses was but a type – Christ. To the Jewish mind, scriptures and events such as the exodus out of Egypt were interpreted through an approach called ‘Midrash’. The main theme to this type of interpretation is that key prophecies and events are repeated over and over throughout history until they find their final fulfilment. For example, the exodus out of Egypt is quoted in the New Testament as a type of Yeshua (Jesus) coming out of Egypt (Matthew 2:15 and Hosea 11:1). It is also seen as a type of the believers in Messiah Yeshua (Jesus Christ) coming out of Egypt (the world) in 1 Corinthians 10. And, this event will have its final fulfilment in the deliverance of Israel in the last days! Through Moses “God’s servant” we have a glimpse into the overall plan of God in His dealings with both the Jewish and Gentile nations …Something quite useful in this crazy age in which we live… an age that is drawing closer and closer to the return of the Messiah! The nation of Israel God’s servant… The nation of Israel was even called the “servant of the Lord” (Isaiah 41:8). It is from this servant nation that God sent His Suffering Servant - Yeshua. God called out a people for Himself so that He could provide a redeemer for the world. It is also through Israel that we received the Messiah, the Bible, the Prophets, Patriarchs, Matriarchs, the Disciples, the Laws and the Promises of God – we owe so much to the Jewish people, true servants of God! All of God’s servants, the prophets, speak of the coming of the soon Coming Messiah Yeshua (Jesus Christ) the true Servant of the LORD. The angel of the LORD called the coming Messiah a “Servant.” “Now listen, Joshua the high priest, you and your friends who are sitting in front of you indeed they are men who are a symbol, for behold, I am going to bring in My servant the Branch,” Zechariah 3:8. The LORD declares to Isaiah the coming of this same person when He says: “Behold, My Servant, whom I uphold; My chosen one in whom My soul delights. I have put My Spirit upon Him; He will bring forth justice to the nations,” Isaiah 42:1. The last of the four Servant poems of Isaiah presents the exaltation, humiliation, substitutionary sacrifice and extreme exaltation of the Servant (Isaiah 52:13 - 53:12). The Suffering Servant of the LORD is perhaps the highest title in the Old Testament for God’s Anointed One – Yeshua the Messiah, servant of Yahweh. As God's servant Ýeshua (Jesus), did what Israel could not do. Matthew quotes Isaiah 42:1-4 and says the prophecy is fulfilled in Jesus, the Servant of Yahweh, who does the will of His Father perfectly. He is in perfect harmony with the Father's intent and will. His first recorded words reveal His divine Sonship and His mission in life. Even as a youth He said, “I must be about My Father's business,” Luke 2:49. Again, He said, “I came to do the will of Him that sent Me,” John 6:38. 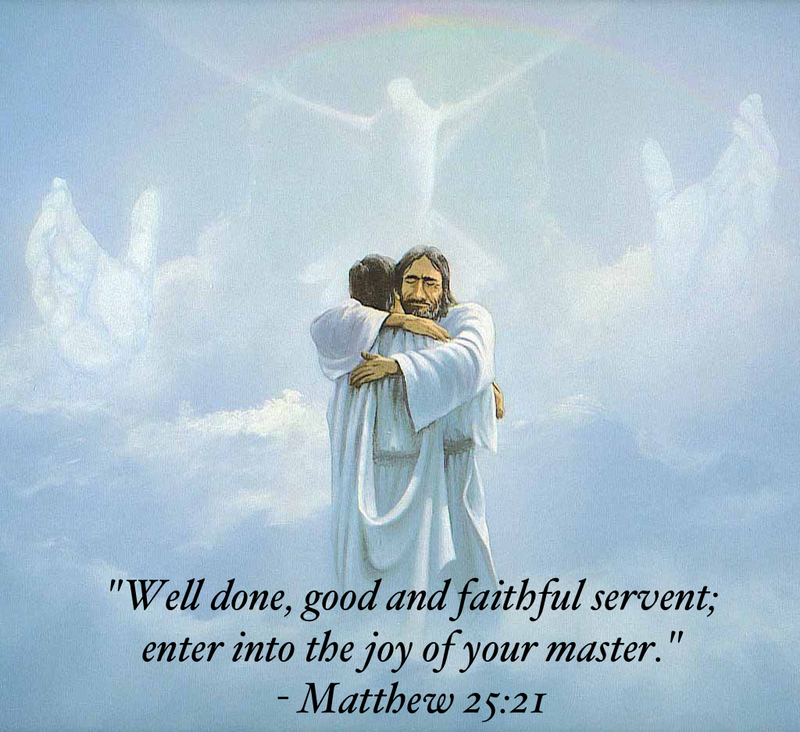 The climax of His “servant hood” is declared in His own words; “For even the Son of Man did not come to be served, but to serve, and to give His life a ransom for many,” Mark 10:45. We most sincerely believe that God WILL bless you for your faithfulness and love for His land and His chosen people. God’s Word is true! He IS watching to see how the nations are treating His people. God will have mercy on Israel through Gentile believers acting as mediators towards them… This is one of the most amazing revelations ever given to the church – an opportunity to do something that carries the highest priority in the heart of God. Yet… sadly, so few have seen the potential and the rewards of serving God in this manner - as agents of mercy to Israel and the Jewish people! Israel was and still is despised today… and a despisable nation continually turning away from God but nothing ever altered the purpose of God for that nation. The despised element is always a noticeable element in the purpose of God. When the Saviour of the world came, He came of that despised nation; like Israel… He Himself was “despised and rejected by men,” …and there is that despised element, “…things that are despised God has chosen,” 1 Corinthians 1:28. Now more than at any time is the time to support Israel and the Jewish people - the Lord’s Brethren! We are witnessing the nations and people turning their backs on Israel. Thank you for your prayers and generous support!